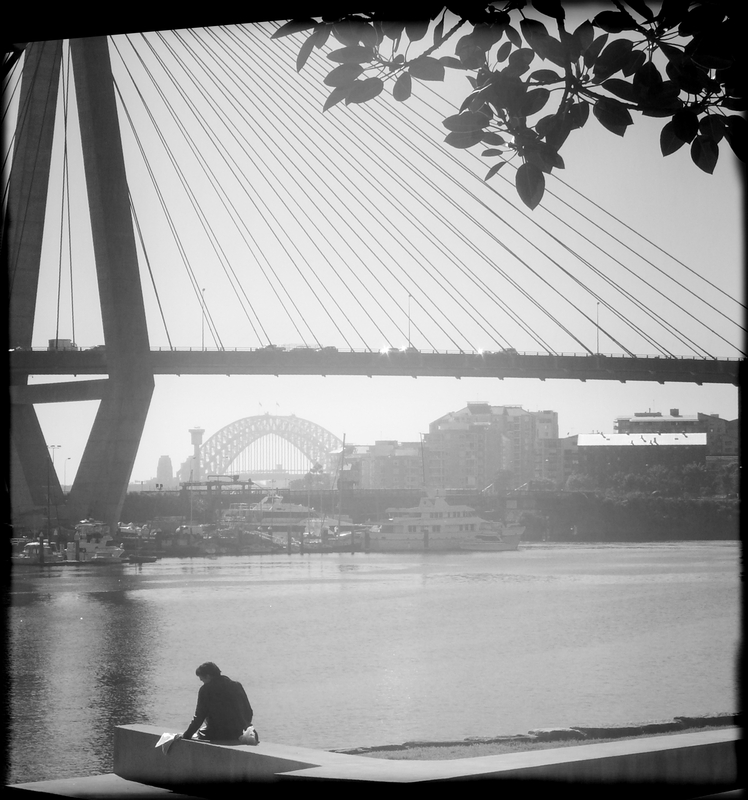 I saw this man sitting by the bay, facing the sun, his face opened wide to the water and the sky. The bridge was strung like a harp, playing the sounds of the city. I saw this man with his slicked back, blue-black hair, his drainpipe jeans and pointed boots and became convinced he had been transported from another era. He was reading and I thought that maybe he was a poet writing of protest and enlightenment, trying to find the heart in the world, trying to find his soul. I thought that he was writing of his childhood sitting in an immaculate kitchen in the 1960s watching his mother, dressed like Jacqueline Kennedy, make a sandwich with the crusts sliced off so neatly she could have been a draftsman. I thought of him eating his sandwich, drinking a large glass tumbler of chilled milk that bubbled and brimmed over the edges while his mother smoked a cigarette so neatly she left a red rim of lipstick in the same spot every time. I wondered if his time in the kitchen with his mother had changed his view of women for good. I couldn’t decide if it was in a good way or a bad way. I couldn’t tell by looking if he cared enough about symmetrical sandwiches and red-rimmed cigarettes to let them alter things for good. I suddenly had to know what he was reading. Was it Ginsberg? Was it Kerouac? I became convinced he was of an existentialist bent and was reading Simone de Beauvoir or maybe even Sartre. I had to know. I had to know. I edged closer, shuffling, pretending to be captivated by the view. I sidled up beside him, excited, hardly able to breathe. He turned a page. His hair was streaked with midnight blue in the sunlight. Just like Elvis. I stifled a giggle. He was reading the betting pages, checking his watch to see who was running in the daily double at Randwick racecourse. Even when the setting lends itself to the dramatic, things aren’t always what they seem. It was funny, really. I do let my imagination run away with me sometimes. Hahaha. Laughing. What is it that makes us imagine a reality so much finer than that which shadows us along our daily routes? I love this look at what if…And I hope he wins the trifecta! I know. I am always creating these alternate scenarios for people I don’t even know. I hope he won too. He deserved to after giving me such a fun time thinking about his imaginary life! This is a cool post. Thanks. Ha, nicely done Selma. Sometimes, I think it is better to just hold onto our vision of what life is as opposed to learning the truth. It’s true, isn’t it? I think this situation goes to show you definitely cannot judge a book by its cover. Hahaha. It’s of course exactly the same problem like in your previous post about looking and seeing. The mind makes the story. Our mind is a fool. Utterly unreliable. We are the fool when we believe what we think, but we are not our mind, we use our mind. Aw shucks…I was hoping it was Elvis, he looks like Elvis to me in this pic. What a great photo though, even though he was just reading the racing news!!! NO WAY! On the same date? Well, our dearest Mitzi is definitely sitting with the King now. I’m sure they would get on well. Awww. What a lovely thought. You could be right, Brad. On the water with those bridges in view is definitely a good pplace to search for her. I hope she helped him pick the winning horse!!! Your imagination is AMAZING. I invent stories about people I see in the streets too – but mine are NEVER as good as yours. Too bad he was just betting on the horses! I had to put my hand over my mouth to stop myself from laughing too loud. Literally. Here I am thinking he was some sort of deep-thinking hero and he’s reading the racing pages. It was hilarious, Cathy. Really gave me a good chuckle!! He might have said in that Elvis rumble: ‘Thank you. Thank you very much.’ Now that would have been really cool. I should have said it! Thank God he wasn’t reading about the Kardashians. That would have completely shattered my illusions. At least the racing pages gave him some kind of street cred! What a vivid & active imagination you have my dear! I love you for that. Hahaha, Selma. Serves you right for being so nosey! Such a build-up – great writing! Hahahaha. It DOES serve me right. I am still laughing about it – he looked so poetic sitting there. LOL.